"I am in due receipt of your letter of January 5, 1974, and the wonderful photograph of Radha Gokulananda, which arrived here safely. The sentiments you express are very praiseworthy in devotional service. Especially it is pleasing to me that you are so happy in your service to the deities. Krsna Consciousness means blissful life, and also that blissful life is eternal and full of knowledge. You say rightly that you are very very fortunate to be serving the Lord. 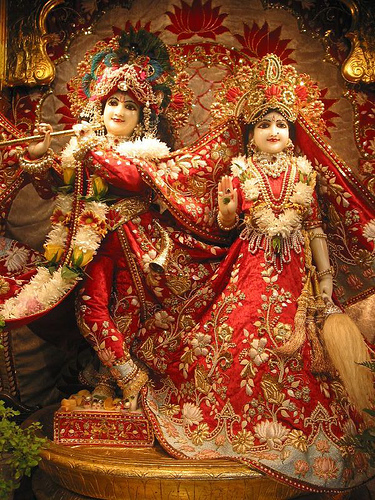 So please work with the other ladies and with your Godbrothers at Bhaktivedanta Manor and make it such a blissful, peaceful atmosphere that many persons will be attracted to come and live with us. You will be glad to hear I am having the picture framed and put in a prominent place in my room."